Think of that one joke you think you tell best. Think about exactly how you would tell it so as to bring out the best of it, to turn the punchline into a nose milk, stomach grabbing laugh fest. 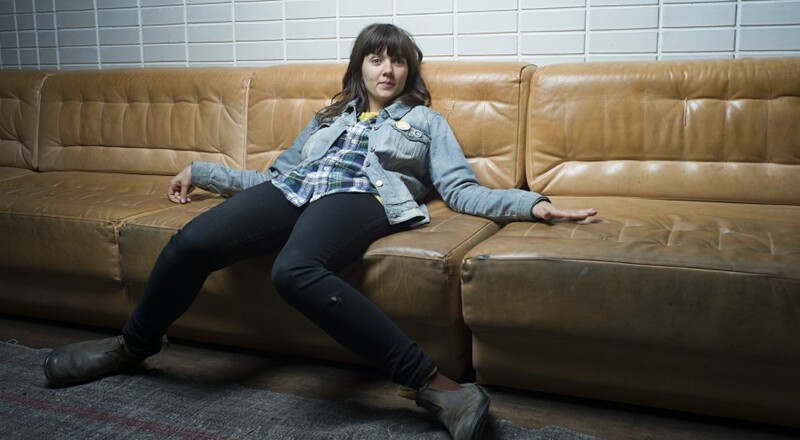 No matter how impeccable your technique, Courtney Barnett is probably better at telling it. And she’ll probably forget the punchline too and still leave you in stitches. Her first major release, 2013 double EP A Sea of Split Peas was a first example of just how earnest one can be in one’s songs, tying together rambling stories about heat-strokes in the garden, dive bar hook-ups, parental worry and lovely quiet nights with friends. There was nothing grand about the themes, there was no affectation whatsoever, Courtney’s delivery was perfect for a storyteller, not letting herself get in front of the events or characters. The music was more of a supporting cast member, backing Courtney’s miniatures with a perfectly fitting shade of alt-rock. And all that was down-to-earth, funny and acutely compelling on A Sea of Split Peas gets kicked up a notch on her debut full-length, Sometimes I Sit and Think and Sometimes I Just Sit. It’s always refreshing to discover a songwriter whose music is beyond genres and simply works in itself. Sometimes I Just Sit… functions outside its musical category simply by virtue of its stellar lyrics. Again, just as on A Sea of Split Peas, music is more of a welcome buddy than the actual focus of the songs. I can’t imagine some other sort of tunes to be more appropriate for the unaffected stories, but still the quietly distorted/sometimes noisy guitars and rugged back-beat drums simply provide the perfect backdrop. The band is tight, their approach is simple and they are really easy to enjoy. A Sea of Split Peas was mostly a confessional piece about Courtney’s own disappointments, long boring days or laid back fun nights, but Sometimes I Just Sit… shows her getting under the skin of different possible people she dreams up. The shift in perspective show an even more advanced craft and the stories themselves only confirm her ever evolving knack for gab. She tells us of an unnamed everyman turning suicidal for not having the opportunity of becoming an elevator operator, of a couple looking for a house in the suburbs and being bummed out by visiting the property of a disabled Vietnam veteran and of the always discouraged Debbie who tries to take control of her life. She also tells us of insomniac random thoughts and silly symbolic interpretations of cracks in the wall, of trying to impress the guy swimming in the lane next to you and making a fool of yourself, and of the extremely annoying indecision state of wanting to go out, but also wanting to stay in on a Saturday night. All of these are recounted by means of tiny details like marmite sandwiches crumbling on the subway, bathroom fixtures meant to help you get in and out of the tub, money saving plans by moving out of the coffee shop filled town center and buying your own percolator or road kill looking like a Jackson Pollock painting. Courtney has an incredible talent at boiling down entire life stories into a few small pieces which are in no way essential, being just insignificant details, but which manage to create an extremely precise image. She also admits to this M.O. on her surprisingly serious song Kim’s Caravan which starts off as a chips and soda walk through L.A. accompanied by environmental thoughts, but turns into a confession of looking for significance in the insignificant. She just reflects events, stories, images, people without attributing meaning, ideas or symbolism. She frees her characters and the situations she describes from being her own and lets us decide what they actually are. She doesn’t work at that level, we do. “Leave your shoes at the door/Along with your troubles” is how Courtney Barnett invites you into her world of minute moments, personal images and unpretentiousness. You grab a glass of wine, turn your phone off, relax and join the anonymous club. Nothing is pressing, nothing is heavy, nothing is that big of a deal. And yet, everything is.